This evening of ambient pop was conceived by Riparian Acoustics (Nick Storring's post-Ratio vehicle for show curation) and given logistical support by Burn Down the Capital and packed the Monarch Tavern with a fairly mixed crowd. As Hans-Joachim Roedelius settled in, one could see a mix of I-Saw-Him-Back-When types with younger heads now weaned on his work as a part of the electronic music canon. His continued technological forward-looking could be seen from his table of gear with multiple laptops and tablets but the main focus here was the grand piano he was seated at. His piano work hinted at both sequencer patterns and Satie-esque calmness with occasional swells into lusher, rolling terrains — quite entrancing, even with a pause for some technical adjustments midway through. 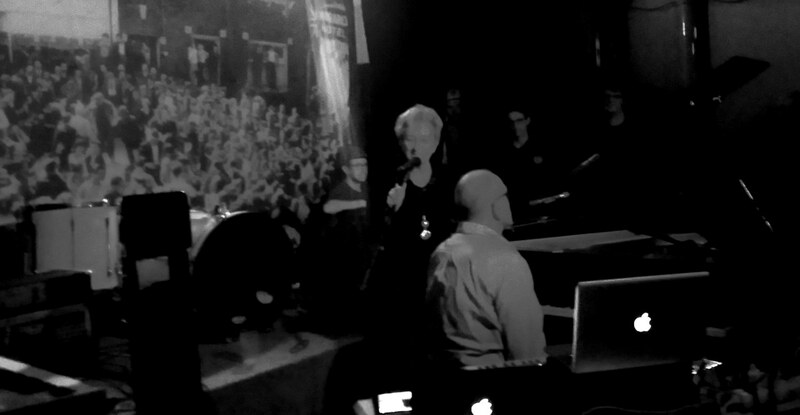 The set closed with Roedelius bringing his wife Christine onto the stage to join him on "By This River" (most famously known from Eno's Before and After Science, but the melody was composed by Roedelius while Eno was recording with Cluster), shifting the song from Eno's icy cold oceans and repositioned into a sweet parlour tune. Roedelius, who seemed very pleased with the warm crowd and the sounds of the opening bands, was in turn showered with affection from the audience, and the night ended with Roedelius offering a toast to the crowd.